It's racket time again, kiddies. Here's the third volume of rare and classy (ahem) rock'n'roll spanning a wide range of styles with the emphasis on WILD. Of the 26 selections, more than half are new to CD including the recently discovered Texan rockabilly gem Too Much Loving Going On, Danny Dell's deranged Froggy Went A-Courting, Flash Terry's frantic Cool It, Bobby Verne's rare Red Hot Car (off tape for the first time), Elroy Dietzel's Rock-N-Bones (again, off tape for the first time), not to mention Mary Petti's quite uncanny Brenda Lee imitation, Hey, Lawdy Lawdy. Then there's Jamie Coe's Summertime Symphony, written and produced by Bobby Darin back in 1959. That one came out in the UK on the old red Parlophone label and is presented here in super-fi sound. British fans of 50s rock have always held an affection for Big Bob's Your Line Was Busy, a New York recording which slipped out virtually unnoticed in Britain on the ill-fated Top Rank label in the late 50s. That's here too. But even that bows in deference to Kid Thomas' demented Rockin' This Joint To-Nite, a disc so wild that tone arms on record decks were known to perspire after each play. In 1958, the American R&B vocalist Bertice Reading came over to the UK and belted out the powerful Rock Baby, Rock It at Abbey Road, battering the tweedy British studio musicians into submission with the power of her voice. This rare example of an American artist showing the British how to rock on their own turf was released exclusively in the UK on Parlophone. It is the only non-US recording heard here. 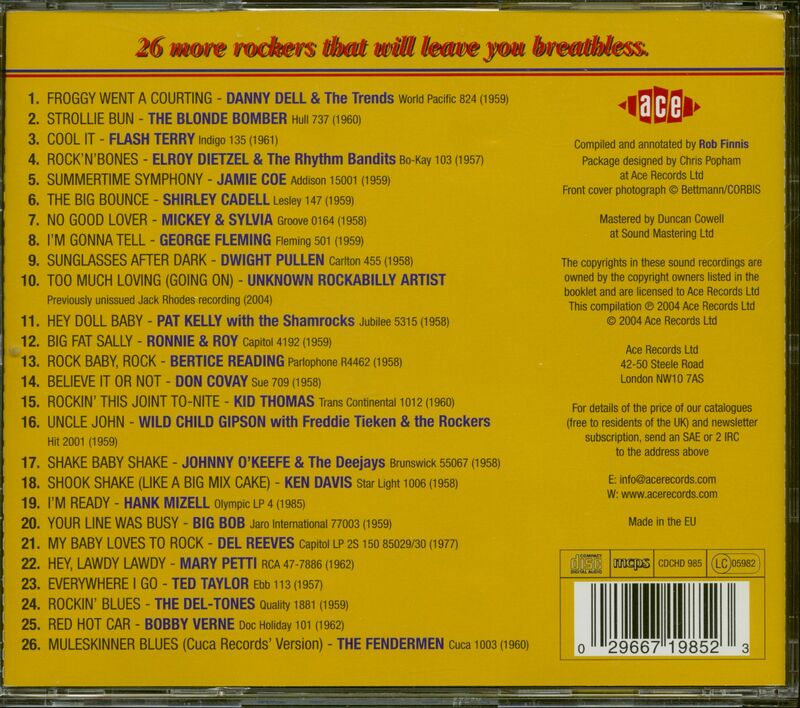 There's more: Shirley Cadell's The Big Bounce was a huge record on the rockabilly scene of the early 1980s and this is the first time it has appeared legitimately on CD. Wild Child Gipson's Uncle John and Strollie Bun by the Blonde Bomber owe more than a nod in Little Richard's direction. These are not the names their mothers knew them by. Of major interest is the original version of the Fendermen's Muleskinner Blues which came out on the tiny Cuca label of Wisconsin. The Fendermen had a major hit with this song in 1960 but not in this form - the hit version was a subsequent re-record for another label. Here's the original earlier cut which few outside rural Wisconsin ever got to hear. It has a fuller sound and a slightly rougher edge. 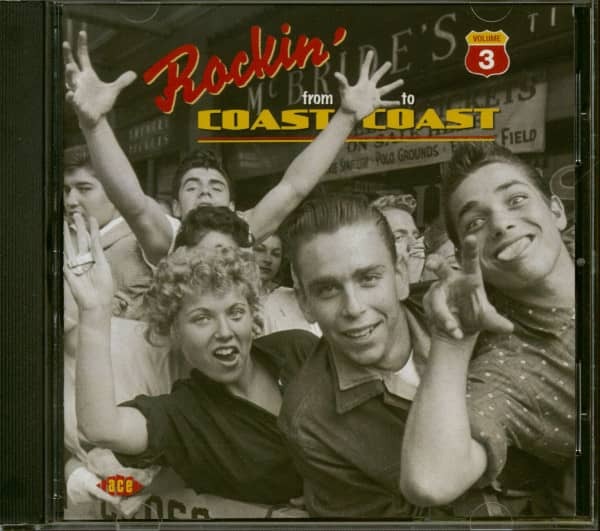 In common with the previous editions, Volume 3 of "Rockin' From Coast To Coast" comes with a fully illustrated, action packed booklet with annotation by Rob Finnis. They're wild, they're woolly and they're willing - these 26 rockers will leave you breathless. 04 Rock 'N' Bones DIETZEL, Elroy & RHYTHM BAND. Customer evaluation for "Rockin' From Coast To Coast Vol.3 (CD)"